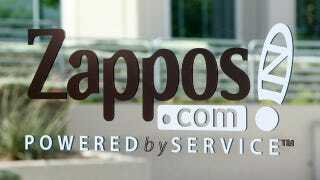 Someone hacked Zappos, and now a nation bites its nails, worried that our shoe shopping habit is in danger. But, thank God, it is not. Your access to sale-priced sneakers and stylish stilettos will not be denied—but you will need to change your password if you want to keep safely procuring three pairs of the same shoe in different sizes and then returning the two pairs that don't fit. Zappos is so beloved and useful a site that it's hard to imagine anyone would want to hurt them, but apparently the thought of getting shoes delivered to their doorstep like three seconds after they ordered them wasn't appealing enough to stop hackers from attacking the site's servers yesterday. Luckily, no credit card or payment information was compromised, but customers will definitely need to reset their passwords. CEO Tony Hsieh told his employees that Zappos will notify their 24+ million customers (that is A LOT of feet!) about the breach and then assist them in setting up a new password—and, of course, it will all be done in the most friendly and most convenient way we've ever seen.